While on the power play, Blake Wheeler fed Mark Scheifele in the slot. Scheifele’s shot was blocked, but the rebound bounced to Kyle Connor at the top of the crease. Connor lifted a backhand over Semyon Varlamov and in. Josh Morrissey passed the puck to Blake Wheeler at the left wall. Wheeler one-touched a pass to Mark Scheifele at the bottom of the left circle where Scheifele quickly snapped a shot that Varlamov got a piece of, but not enough as it slid under his pad and in. Carl Soderberg dropped a pass to Erik Johnson on the right wall. Johnson moved into the right circle and lifted a shot over the shoulder of Connor Hellebuyck and in. Blake Wheeler stole the puck at the Colorado blueline and broke in 2-on-1 with Nikolaj Ehlers. Wheeler moved to the top of the crease before sliding a pass across to Ehlers, who took it from his forehand to his backhand and in. 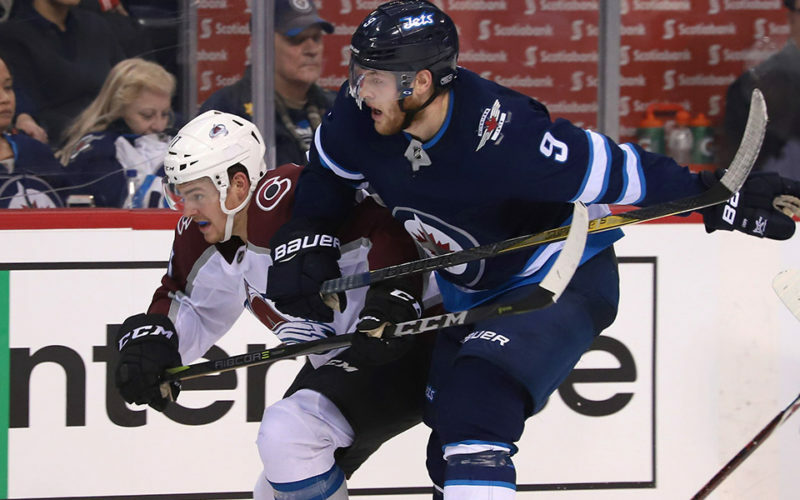 Tyson Barrie hit a streaking Alexander Kerfoot at the Jets blueline. Kerfoot moved down the left wall before sliding a pass in the slot where Tyson Jost one-timed a shot under the left pad of Hellebuyck and in. While on the power play, Dustin Byfuglien passed to Blake Wheeler in the right circle. Wheeler sent a pass across to Patrik Laine in the left circle. Laine one-timed a shot under the arm of Varlamov and in. With the Colorado net empty, Blake Wheeler picked up the loose puck in the Jets zone and from his own blueline fired it the into the open net. The Jets improve to 9-5-1 overall and 6-2-1 at Bell MTS Place. Went 2-for-4 on the power play and have now scored a power play goal in a 11 consecutive games (14-for-37, 37.8%). Led the Jets with four hits in the first period. Left the game after the first period with an upper body injury. Went 5-for-6 in the faceoff circle in the first period and is 9-for-15 in the game. Led the Jets in ice time tonight with 25:29 and blocked shots with three. Extended his point streak to nine games (2G, 15A) and assist streak to seven games (13A). Has multiple assists in three consecutive games. It’s the fifth time in his career that Wheeler has registered four assists in a game. Finished the night with three points (1G, 2A). It’s Scheifele’s third multi-point game of the season. Scored his eighth goal of the season tonight with a power play goal in the third period and now has five goals in his last three games. Seven of his eight goals have been on the power play. Led the Jets with five shots. Scored his third goal of the season which turned out to be the game-winner. It’s Ehler’s first GWG of the season and 12th of his career. Opened the scoring with a power play goal in the first period. The goal was his 7th of the season. Extended his point streak to five games with an assist tonight. Byfuglien has seven points (1G, 6A) during the streak.